Today, we take a look at two children’s books that are somehow related to Oz, although they aren’t Oz books or even by an author who wrote Oz books. Prince Silverwings and Other Fairy Tales, by Edith Ogden Harrison – L. Frank Baum had wanted to collaborate with Harrison in a stage musical adaptation of this book, but thanks to the Iroquois Theater Fire of 1903 it never happened. The book itself is a short collection of fairy tales, pretty slight and not all that memorable. I mean, I just read them and I’ve already forgotten most of them. The titular story is about a fairy who is allowed to marry his queen after performing a good deed. There’s also a tale about the origin of mermaids, and one about the Man in the Moon marrying a cloud maiden. This is an interesting coincidence as I just wrote an Oz story concerning the Man in the Moon and his wife, although she isn’t a cloud maiden there. From what I’ve been able to find online, mostly from the Wonderful Wiki of Oz, the play incorporated elements from different stories in the volume and added other ones as well. The villain, who didn’t appear in any of the stories, is the Gnome King Kwytoffle, who is afraid of beans. Maybe he just has a gas problem. Anyway, Baum would later use the idea of a Nome King who’s afraid of eggs in his Oz books, and the name Kwytoffle was given to a phony magician in The Enchanted Island of Yew. The Golden Goblin, by Curtis Dunham – The link to Oz here is much more tangential. 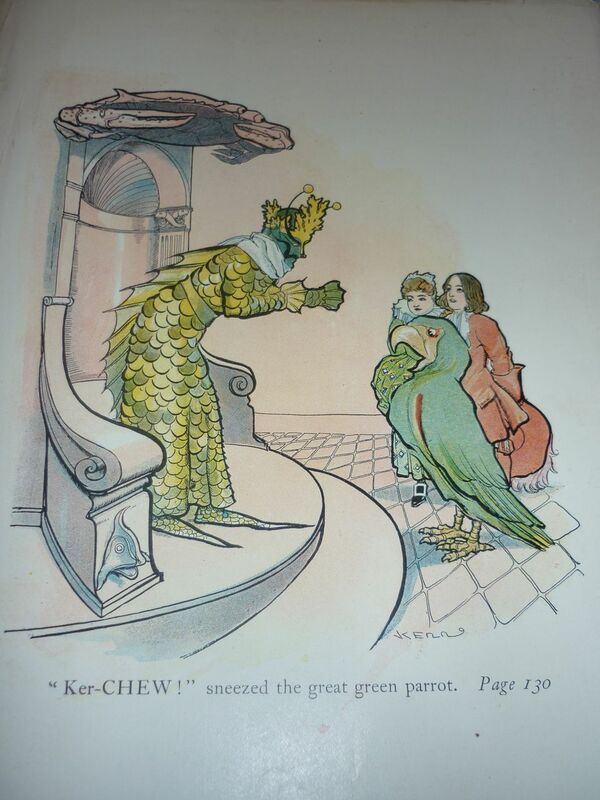 George Kerr, who illustrated the second edition of Baum’s American Fairy Tales, was also the illustrator for this book. It’s sometimes cited as an Oz imitation, but I don’t really see too much about it that’s imitative. It does, however, bear quite a few similarities to The Pearl and the Pumpkin, and both of these books are referenced in Hugh Pendexter’s Wooglet in Oz. The story is about two Dutch children, Jan and Gurtruida, who are stranded at sea after a shipwreck. During the course of their adventures, they visit the Flying Dutchman, Neptune, and of course the Golden Goblin. Actually, the Goblin doesn’t appear until pretty far along in the story, although he’s mentioned a few times before that. Neptune’s wife, the Queen of the Sea, is never named, although I guess if we wanted to be accurate to Roman mythology she’d be Salacia. The friendly Master Spray is said to have prophetic powers, possibly a reference to the sea god Glaucus. The Goblin sort of reminds me of Zog from The Sea Fairies, although he’s less of a straight villain. At one point he tells the Flying Dutchman mutineers, “You have been caught red-handed in next to the gravest crime mentioned in the Royal Statutes. Modesty forbids me to mention the greatest crime of all…I leave that to your imaginations.” I suppose this is an example of the “second biggest” joke from long before Get Smart. Overall, I found the story to contain a lot of good ideas, but I feel it didn’t develop many of them all that thoroughly. For instance, the Animated Anchor had the potential to be an interesting character, but was more of a brief gimmick. In Wooglet, the Goblin wants to marry Uncle Chris and Dr. Nikidik to his daughters, the Princesses of the Four Winds, something he also tried to do with the ghost sailors in Dunham’s book. We also find out that he’s employed the devilfish that used to serve Zog. This entry was posted in Book Reviews, Fairy Tales, Greek Mythology, Hugh Pendexter, L. Frank Baum, Mythology, Oz, Oz Authors, Roman and tagged curtis dunham, flying dutchman, george kerr, glaucus, goblins, kwytoffle, man in the moon, mermaids, neptune, nome king, prince silverwings, prince silverwings and other fairy tales, the enchanted island of yew, the golden goblin, the sea fairies, wooglet in oz, zog. Bookmark the permalink. Good post and great new story (I posted some comments on that blog)! As regards the giantess wife of the Man in the Moon you created, I don’t see any reason why she couldn’t also be (or have been) a cloud maiden. That could be a story unto itself! I love that Pendexter tied in other ancillary fairy-tales from that era into Oz! That’s what I’m trying to do as well. It’s a challenge, but a fun one. Your blog is an aid in that endeavor because you’re good at catching connections (and lapses) between stories in continuity! Or the Man in the Moon could have been married more than once. There are several possibilities there.